Manchester City stars sat through one of manager Pep Guardiola’s longest post-match inquests after the demoralising defeat at Newcastle. 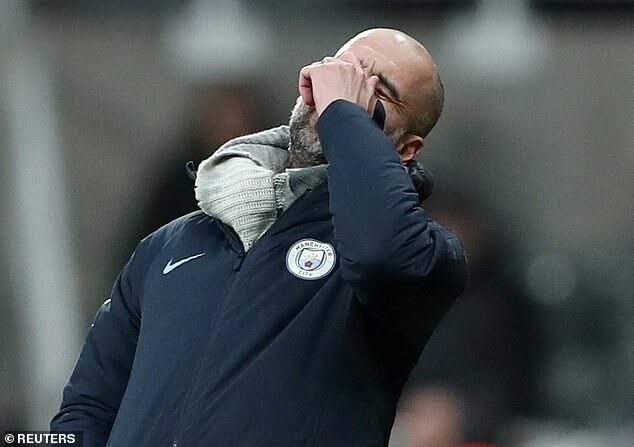 The Premier League champions are understood to have been in the dressing room for about half an hour as Guardiola demanded answers following the 2-1 loss. Sources claimed that ‘raised voices’ could be heard from inside the St James’ Park tunnel during what was described as an ‘unusually long debrief’. Guardiola, who refuses to admonish his players publicly, was unhappy at City’s level of performance. He felt they should have pressed home their early advantage following Sergio Aguero’s opener after 24 seconds, and could not understand why they eased off before half-time. He was also frustrated during wins against Huddersfield and Wolves earlier this month for similar reasons. Leroy Sane revealed that players had received a rocket and were told to ‘wake up’ at Huddersfield’s John Smith’s Stadium. 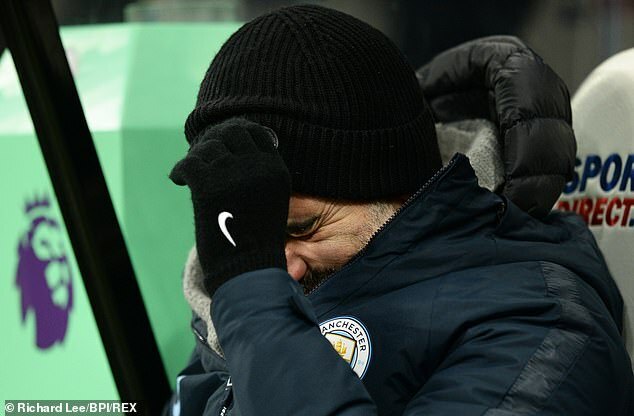 City ‘stopped playing’ when a goal clear in those games, according to their manager, and they surrendered 1-0 leads in defeats by Crystal Palace and Leicester City either side of Christmas. 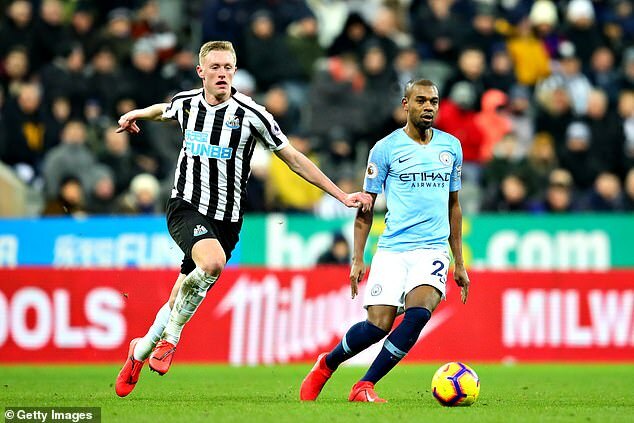 Guardiola argued that City were not aggressive enough in midfield against Newcastle, where Sean Longstaff was making only his second home league start. City now face three matches in a week — against Arsenal, Everton and Chelsea — and will be looking for a trio of victories to keep pace with leaders Liverpool. 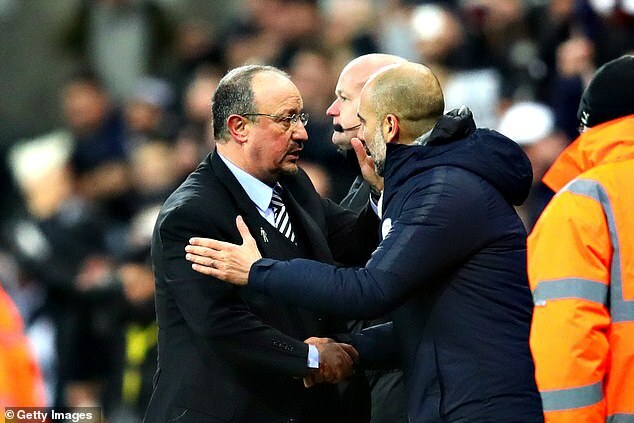 Guardiola is an emotional character with the players he ‘loves’ and his inquest on Tuesday night went on for so long that it prevented him from saying farewell to Rafa Benitez. Sportsmail understands Guardiola and his first-team coach Rodolfo Borrell had planned to head for the Newcastle manager’s office to share a glass of wine. Meanwhile, 18-year-old winger Rabbi Matondo completed his move to Schalke, who face City in the Champions League next month. Matondo is thought to have cost Schalke in excess of £10million despite never having made a first-team appearance.